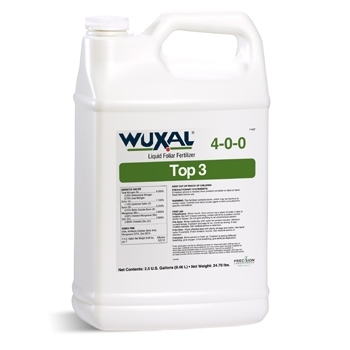 Wuxal Top 3 is a liquid fertilizer that provides a balanced supply of nitrogen, manganese and zinc. Top 3 is an ideal supplement for manganese-responsive crops such as soybeans, and zinc response crops like corn. The cationic micronutrients of manganese and zinc in Top 3 are fully chelated with EDTA to ensure tank mix options and maximum nutrient efficacy. In addition to manganese and zinc, Top 3 provides additional nitrogen and sulfur nutrition to the targeted crop. See chart below Features & Benefits.